Maes y Mor01970 639270work01970 623621fax HostelMaes y Mor hostel is situated 80 metres from Aberystwyth beach and 500 metres from the bus and train station and offers superior accommodation at budget prices. Launderette facilities onsite. Lock up shed for bicycles (by prior arrangement). A warm Welsh welcome guaranteed. We are a three-star hostel in the picturesque seaside town of Aberystwyth, Mid Wales, offering cheap accommodation to couples, families and friends as well as single travellers. 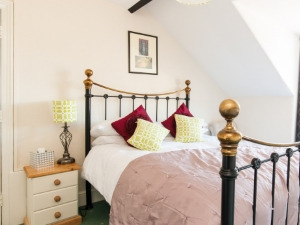 Although our rooms are very affordable, they are clean and comfortable with good quality beds and furniture, providing the ideal base for exploring Aberystwyth as well as both the North Wales and South Wales areas. Our guests, pleasantly surprised by the quality of our cheap hostel accommodation, often comment that our rooms are of equivalent quality to guest house rooms. Many clients are so satisfied with their stay that they return to us time and time again. Guests stay with us on a room only basis, although there is a large kitchen-diner with fridge/freezer, hob oven, toaster and microwave for guests to share. There is a 24-hour convenience store within minutes of the hostel, and a selection of supermarkets in the town, so guests can prepare and enjoy their own food during their stay. The grid shows the prices and daily availability from Tue 23 Apr 19 to Thu 2 May 19. It's easy to check availability for particular dates; just use the calendar to choose the check in date, select the number of nights and click the 'Search' button. Click the Book or Reserve button to book the highlighted days. With Book the bedroom booking will be confirmed immediately, with Reserve the bedroom reservation will be confirmed within 24 hours..